We know you're a fan of hot salsa so we wanted to give you an idea of what we're doing. Laurie's Buffalo Gourmet is going to boldly step up to the big leagues of the snack food industry with a cool new design and new accredidations. Laurie would like to discuss with you how her small town chip n' salsa company is looking to jump out in the snack isle and how she'll finally be able to play on the same field as all the "Heavyweights" of the snack world. 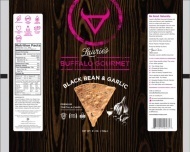 Like the Laurie's Buffalo Gourmet consumers, the company is looking to be adventurous and bold in their bag design with a black and woodgrain background and a lone, all-natural chip at the forefront of their bag. This will also be the very first time the company can claim such necessities as: gluten free, kosher, and organic. Virtually every snack company is complacent with a bag that fits into the same natural looking colors. Laurie's is combining the natural looking color of it's snacks with a bold, black background. Along with the colors, any nationally distributed snack company, especially tortilla chips, has to have key designations such as kosher, gluten free if they are, and organic if they are as well. By not having these designations a large portion of the the consumer base immediatly steps over any companies that do not have the necessary symbols on the bag. Laurie's now is on the same level, finally. Lastly, Laurie's Buffalo Gourmet is sponsoring a "Big Dreamer" award at schools throughout NYC, Denver, and Utah. A case of chips n' salsa will go to each months winner that meets the requirements and Laurie's hopes to expand this to many schools across the country. If you'd like to sample what the Big Dreamers receive, please let us know and we'll send you some Laurie's Love.